The best way to take care of your skin is to start from the inside. We are what we eat. The better you eat, the better you’ll look on the outside. The worse you eat, the worse you’ll look and feel, as well. Eating a healthy, clean diet will help you achieve a great-looking skin. Even though there are many ways to improve skin problems and diminish skin damage, the best way to fight these is to prevent it. There are many things we can do to avoid getting dark spots, acne scars, and other unwanted markings in our skin. Among those things is eating a good balanced diet that includes vitamin rich and powerful antioxidant foods. Today we share with you a list of some of the best foods to start including in your diet today to obtain a great skin. 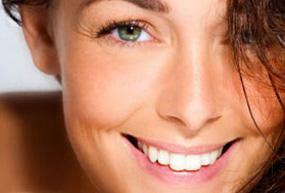 A well known essential vitamin for healthy skin is Vitamin A. “A” is found in low-fat dairy products, preferably with no added sugar. Vitamin A enhances our immune system which will result in clear skin. Eating pineapple, kiwi, papaya and other non-tropical fruits like strawberries, will provide you with a healthy dose of another vitamin: Vitamin C. This vitamin is a soldier when it comes to fighting free radicals, which damage the skin and cause fine lines. Another fruit to add to the list is antioxidant rich blueberries. These tiny blue fellows have the most antioxidants per serving compared to other berries and fruits. Antioxidants help combat premature aging by fighting free radicals, as well. Included in this list are carrots, pumpkin, and apricots, among others. Beta carotene, found in high levels in these foods, is another antioxidant that will get converted into Vitamin A. It helps repair skin tissue and it also acts as a natural block to Sun rays. These nuts have high quantities of Vitamin E. This vitamin helps nourish your skin, and also protects it from sun’s UV rays. They also have rich levels of monosaturated fat, which is a “good” fat that will help lower your cholesterol. Spinach, green leafy vegetables, tomatoes, beans, peas, lentils, salmon, mackerel and other fatty fish. Start taking the right precautions today, so you avoid skin damage in the long run and prevent wrinkles, fine lines and other skin scars we don’t like. Read about some of the most essential health tips for women and other tips to take care of your body. October Laser Spa Specials in Denver LASER SPA DECEMBER SPECIALS Starting Today!